Asset management software that simplifies employee provisioning and automates the collection of assets, including computers, mobile phones, tablets, online accounts, security codes and more. 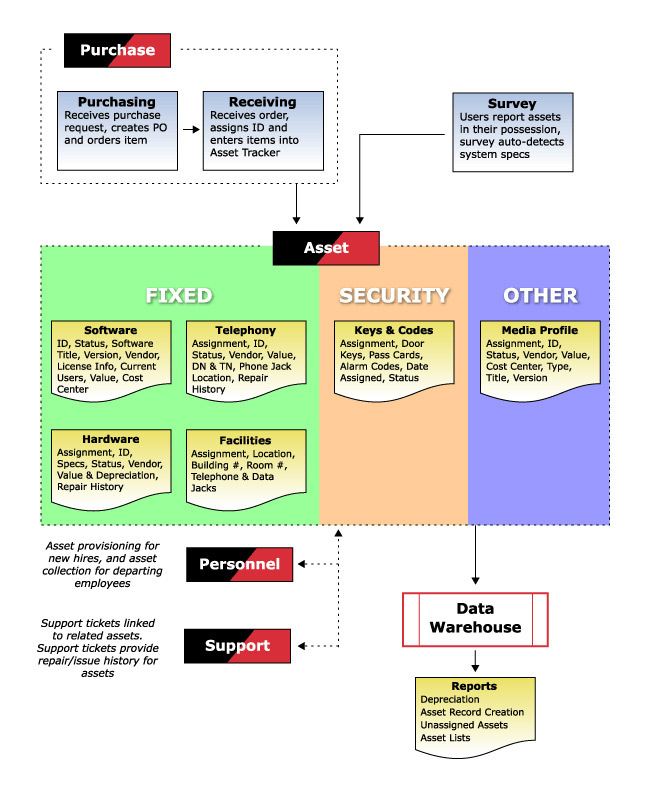 Asset Tracker is a Web based asset management system that simplifies asset profiling and documentation, cataloging, provisioning, collection, and depreciation, for assets including hardware (laptops, mobile phones, tablets), software, security assets (codes, passwords and keys), furniture and telephony. Asset Tracker also streamlines the asset request process with approval routing. Through Asset Tracker, organizations can quickly search through their asset inventories, with features for filtering and sorting by asset type, assignment, model and more. Asset Tracker provides a wide range of views for tracking assets and asset requests, including “Completed Asset Request”, “Cancelled Asset Request”, “Completed for Purchase Request”, “New Asset Request Status” and more. Asset Tracker features provisioning lists that simplify employee roll-on, as well as termination checklists that ensure assets, including keys, mobile phones, system accounts and codes, are all collected when employees leave the company. For businesses with numerous and sometimes expensive assets which are unidentified and untracked, Asset Tracker offers a "Survey" function which quickly assembles an organization-wide, searchable and sortable catalog of assets. With a mouse-click, a Survey form is emailed to all employees. Once opened, the Survey automatically detects the system specifications of the recipient's computer (including processor, installed RAM and operating system) as well as all installed applications and automatically populates the responses. The recipient also reports the other various assets in their possession and then returns the Survey, which automatically inputs reported items into Asset Tracker. We have spent a few decades perfecting the art of software design and development. Here are a few examples of Asset Tracker at work. 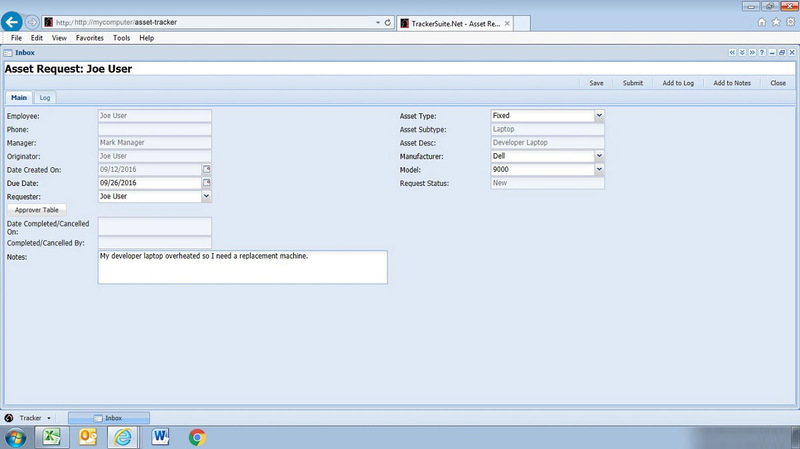 Configurable workflows for employee provisioning, asset requests and collection. 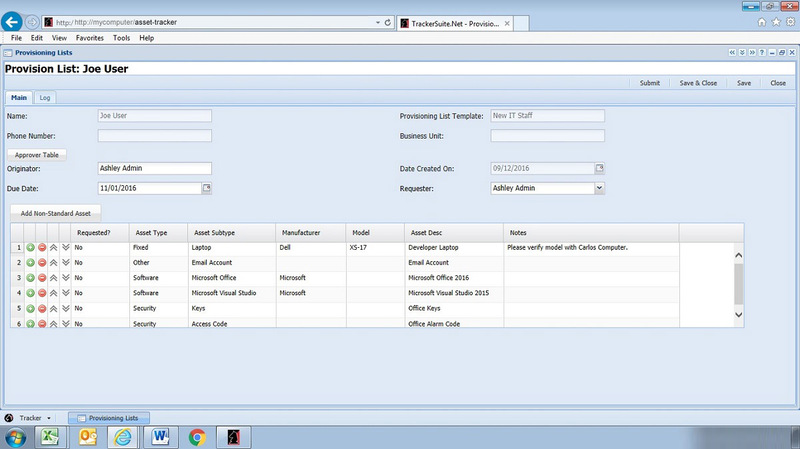 Provisioning templates facilitate the creation of employee provisioning lists. Asset profiles include custom fields for capturing additional information for different types of assets, as well as notification triggers on Asset Types (for asset requests, termination requests, asset request completion and purchase requests). Optional automatic creation of asset requests on provisioning list approval as well as notification to people profiled. Security for all forms based on roles: creation, editing and deletion. Validation profiles for forms- customer can profile specific validation for forms (for example, force Asset Tag to be required for Asset, force Due Date to be required for Asset Requests, etc.). Ability to add shipping details for assets and track shipping status. Asset Tracker Inbox and Outbox simplify the management of asset requests, provisioning and termination list approvals from single place. Automatic email notifications with links to parent form. Optional marking assets for return on Termination list approval, along with notification to people profiled to receive such notification. Option for detecting all or selected installed software on user's machine, along with other operating system parameters on Survey form. Web Views with searching, filtering and caching previous search information capability. 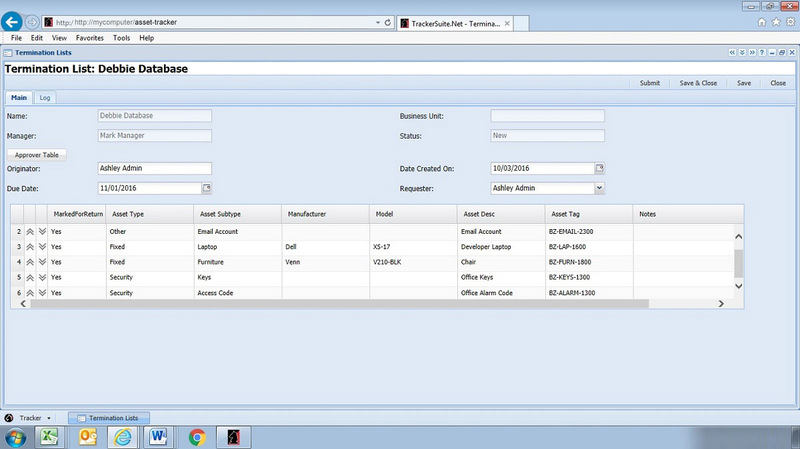 Asset Tracker integrates with the other Web based Tracker Suite modules, facilitating IT and reporting processes. 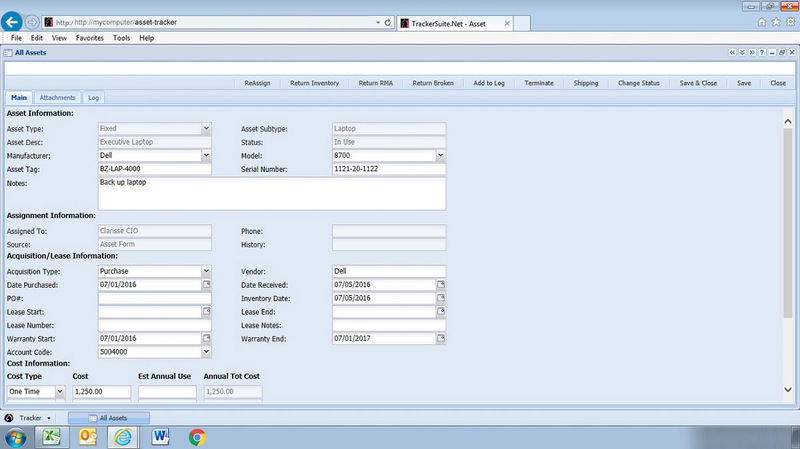 For IT departments, its integration with Support Tracker helps develop and maintain an asset repair/issue history. 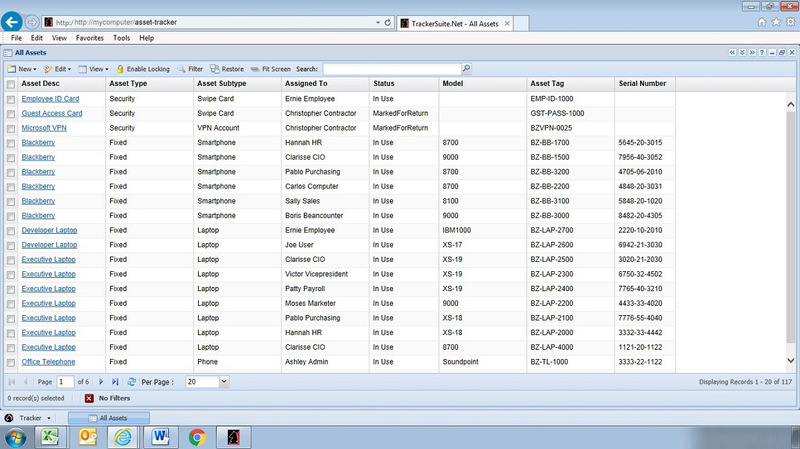 Through the Tracker Data Warehouse reporting engine, organizations can develop reports on software, hardware and fixed assets, and generate asset lists.